nb. In the event of an increase in VAT will apply the highest one in force. 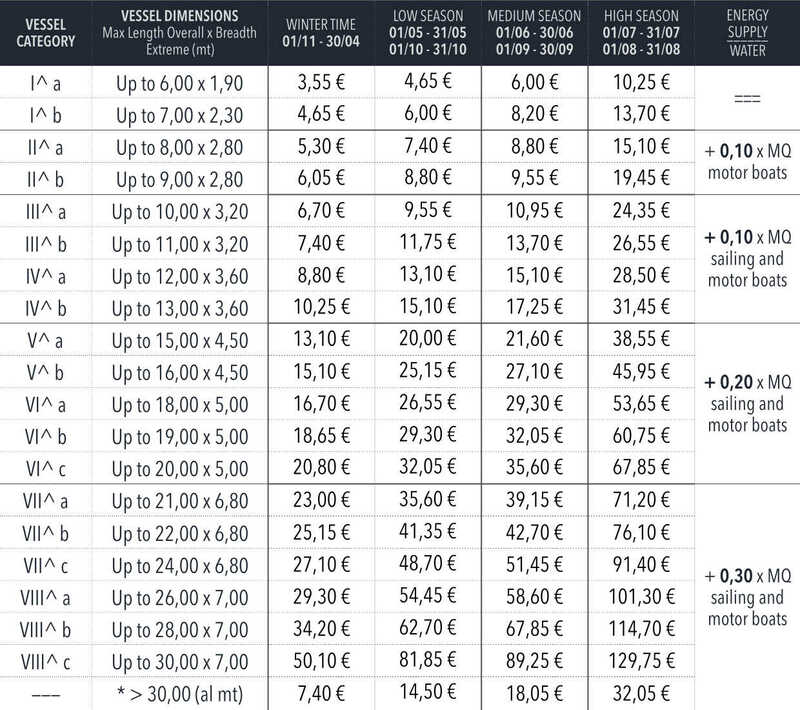 Annual fees for permanent users are applied to square meters stretch of water on the berth occupied; the surface shall be calculated in relation to the category measures, length and breadth. 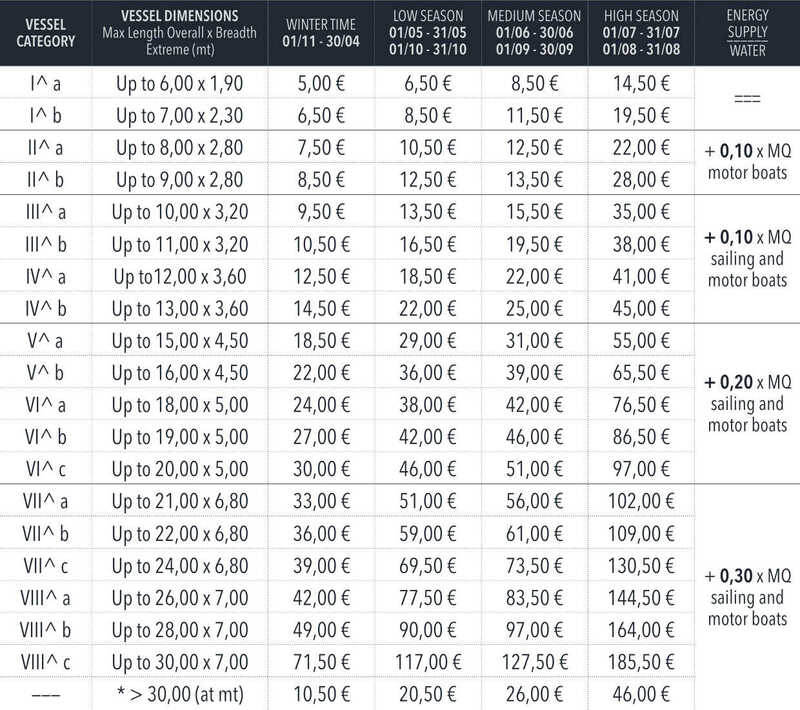 Any unit that should exceed the standard mooring surface, will be required to pay that surplus, calculated on the unit overall length and breadth, including any overhanging structures (teak, delfiniera, spiaggina, etc.). Is user’s annual permanent faculty apply for mooring temporary waiver for the period 15.06-15.09. The waiver must be filed on the appropriate form and delivered to the port authority. The fee reduction for the temporary waiver period shall be calculated only in relation to the actual days of berth occupation from the Marina Management. Rates include 22% VAT: (in case of VAT increases, the current rate will be applied). Special “Winter” rate (for a minimum stay of 3 months): from October 1 to april 30 (212 days.) € 0,22 per mq per day. 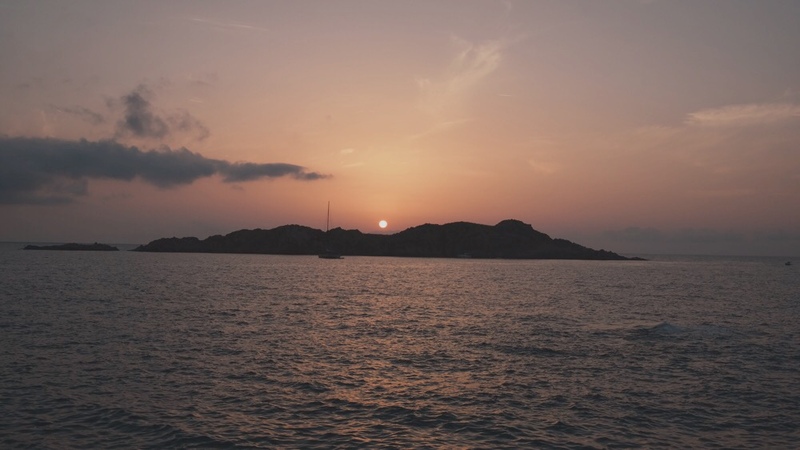 No discounts are available for any category of users (private, business, and fishermen). Short-term contracts over 120 continuous days from 01/06 to 30/09 will be granted a 10% reduction on rates. Upfront payment upon contract signature. No Installment payments. Rates referring to a linear meter of length across all units, including any protruding structures (bowsprit, sundecks, etc.). 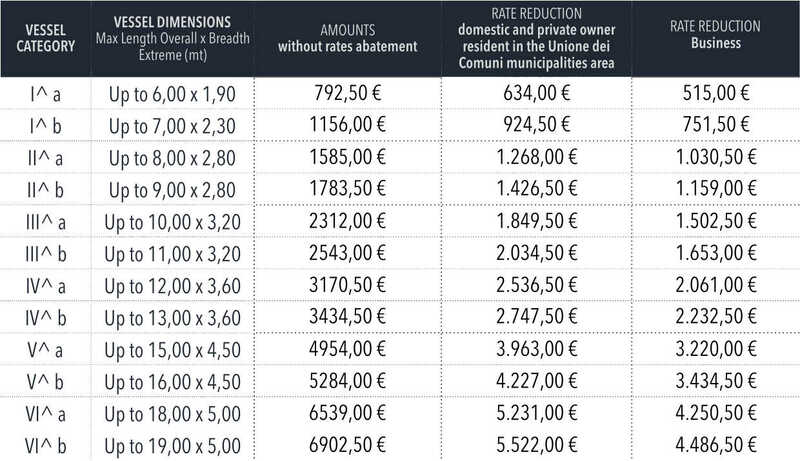 Tariffe riferite a metro lineare di lunghezza fuori tutto delle unità, incluse eventuali strutture sporgenti (delfiniere, spiaggina, etc.). Unauthorized occupation of spaces at sea or on shore. Offenders will be punished by application of the Code of Navigation and other applicable rules. Download, fill in and send by e-mail at info@portoisolarossa.com or hand deliver at port authority offices.